06.09.18 19:53;Account;Receive;Received Payment 0.6 USD from account U18015928 to account U1294000. Batch: 227458063. Memo: API Payment. Withdraw to allhyips from visimifinance.com. 08.09.18 20:49;Account;Receive;Received Payment 0.6 USD from account U18015928 to account U1294000. Batch: 227676392. Memo: API Payment. Withdraw to allhyips from visimifinance.com. 07.09.18 13:10;Account;Receive;Received Payment 0.6 USD from account U18015928 to account U1294000. Batch: 227531357. Memo: API Payment. Withdraw to allhyips from visimifinance.com. 10.09.18 13:05;Account;Receive;Received Payment 0.6 USD from account U18015928 to account U1294000. Batch: 227846596. Memo: API Payment. Withdraw to allhyips from visimifinance.com. 11.09.18 13:39;Account;Receive;Received Payment 0.6 USD from account U18015928 to account U1294000. Batch: 227973501. Memo: API Payment. Withdraw to allhyips from visimifinance.com. 12.09.18 12:54;Account;Receive;Received Payment 0.6 USD from account U18015928 to account U1294000. Batch: 228094147. Memo: API Payment. Withdraw to allhyips from visimifinance.com. 14.09.18 21:46;Account;Receive;Received Payment 0.6 USD from account U18015928 to account U1294000. Batch: 228385633. Memo: API Payment. Withdraw to allhyips from visimifinance.com. 14.09.18 02:46;Account;Receive;Received Payment 0.6 USD from account U18015928 to account U1294000. Batch: 228282406. Memo: API Payment. Withdraw to allhyips from visimifinance.com. 15.09.18 15:53;Account;Receive;Received Payment 0.6 USD from account U18015928 to account U1294000. Batch: 228462866. Memo: API Payment. Withdraw to allhyips from visimifinance.com. 16.09.18 21:04;Account;Receive;Received Payment 0.6 USD from account U18015928 to account U1294000. Batch: 228591744. Memo: API Payment. Withdraw to allhyips from visimifinance.com. 20.09.18 16:11;Account;Receive;Received Payment 0.6 USD from account U18015928 to account U1294000. Batch: 229065706. Memo: API Payment. Withdraw to allhyips from visimifinance.com. 20.09.18 08:58;Account;Receive;Received Payment 0.6 USD from account U18015928 to account U1294000. Batch: 229016858. Memo: API Payment. Withdraw to allhyips from visimifinance.com. 21.09.18 16:09;Account;Receive;Received Payment 0.6 USD from account U18015928 to account U1294000. Batch: 229175451. Memo: API Payment. Withdraw to allhyips from visimifinance.com. 24.09.18 04:10;Account;Receive;Received Payment 0.6 USD from account U18015928 to account U1294000. Batch: 229418652. Memo: API Payment. Withdraw to allhyips from visimifinance.com. 23.09.18 06:07;Account;Receive;Received Payment 0.6 USD from account U18015928 to account U1294000. Batch: 229325789. Memo: API Payment. Withdraw to allhyips from visimifinance.com. 25.09.18 21:18;Account;Receive;Received Payment 0.6 USD from account U18015928 to account U1294000. Batch: 229644610. Memo: API Payment. Withdraw to allhyips from visimifinance.com. 25.09.18 05:24;Account;Receive;Received Payment 0.6 USD from account U18015928 to account U1294000. Batch: 229544232. Memo: API Payment. Withdraw to allhyips from visimifinance.com. 28.09.18 09:45;Account;Receive;Received Payment 0.6 USD from account U18015928 to account U1294000. Batch: 229921358. Memo: API Payment. Withdraw to allhyips from visimifinance.com. 27.09.18 12:59;Account;Receive;Received Payment 0.6 USD from account U18015928 to account U1294000. Batch: 229826609. Memo: API Payment. Withdraw to allhyips from visimifinance.com. 29.09.18 14:07;Account;Receive;Received Payment 0.6 USD from account U18015928 to account U1294000. Batch: 230055544. Memo: API Payment. Withdraw to allhyips from visimifinance.com. 01.10.18 17:31;Account;Receive;Received Payment 0.6 USD from account U18015928 to account U1294000. Batch: 230625737. Memo: API Payment. Withdraw to allhyips from visimifinance.com. 30.09.18 12:04;Account;Receive;Received Payment 0.6 USD from account U18015928 to account U1294000. Batch: 230145050. Memo: API Payment. Withdraw to allhyips from visimifinance.com. 03.10.18 07:34;Account;Receive;Received Payment 0.6 USD from account U18015928 to account U1294000. Batch: 230799787. Memo: API Payment. Withdraw to allhyips from visimifinance.com. 04.10.18 13:07;Account;Receive;Received Payment 0.6 USD from account U18015928 to account U1294000. Batch: 230952969. Memo: API Payment. Withdraw to allhyips from visimifinance.com. 04.10.18 13:07;Account;Receive;Received Payment 0.6 USD from account U18015928 to account U1294000. Batch: 230952946. Memo: API Payment. Withdraw to allhyips from visimifinance.com. 06.10.18 06:01;Account;Receive;Received Payment 0.6 USD from account U18015928 to account U1294000. Batch: 231148350. Memo: API Payment. 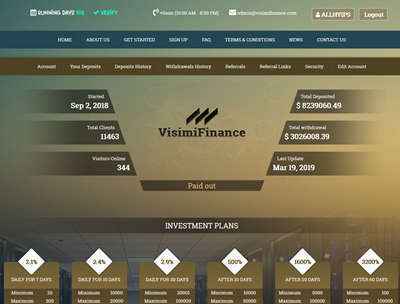 Withdraw to allhyips from visimifinance.com.